Vancouver Canucks: The Good in the Bad. It’s easy to look at the Vancouver Canucks season and completely write it off as a disaster. And yes it is true that this is hardly their best season on record and that the team will most likely miss the playoffs BUT despite all of the negatives surrounding their season, there is still a lot of good when you look back behind the layers. And as you know, with me, if you follow my blog or my social media that I will ALWAYS find a silver lining when it comes to my Canucks. Mattias Ohlund being inducted into the Canucks Ring of Honour before a loud home crowd and a winning effort on home ice. MATTIAS, MATTIAS, MATTIAS! A fan favourite when he played for the team and still even now. The hockey talks initiatives that took place in February as well as continuing everyday with the Vancouver Canucks to continue the conversation on the importance of mental health awareness. The 4-game win streak to start the season or their great run after Christmas while they may not have lasted, were both incredibly fun to watch. Troy Stecher. Etch a stech. The home grown talent that was never supposed to make the roster but due to his strong play early in training camp and injuries that hit the blue line, he quickly became a Canucks roster staple. Did anyone believe prior to the season that Stetcher would become one of the Canucks most reliable blue line members? Or how about Nikita Tryamkin? Who doesn’t love seeing a good Tryamkin smash in a game? There was a lot of uncertainties with the BFG early in the season when he refused to be sent down and there was not a spot…but he proved he was more than ready to be an anchor on an NHL blueline. Markus Granlund and Sven Baertschi have continued to evolve amassing 19 goals and 16 goals respectively. Bo Horvat continues to grow his game and his impact on the community. He’s hit new career highs in points and goals during a season but also surpassed the 100 NHL points milestone! The first 20-goal season for Horvat is in the books! Did you think that the points leader on the Canucks roster this season would be Bo? And with 13 games remaining on the season, he’s still got time to add to those points totals! Sign me up for team Goldy! What a debut for him, it may have been limited minutes but what a preview of things to come with his highlight reel breakaway goal. I suppose that’s the long winded way of me saying that it’s been incredible to see the maturing of the younger players on the team. It’s fun to see the potential of the future of this team. Not to be overlooked is the veteran leadership on the team. Players like Alex Edler and Chris Tanev have been mentoring the youth on the back end. Ryan Miller has been a steadying force in the crease while mentoring and welcoming players to the roster. 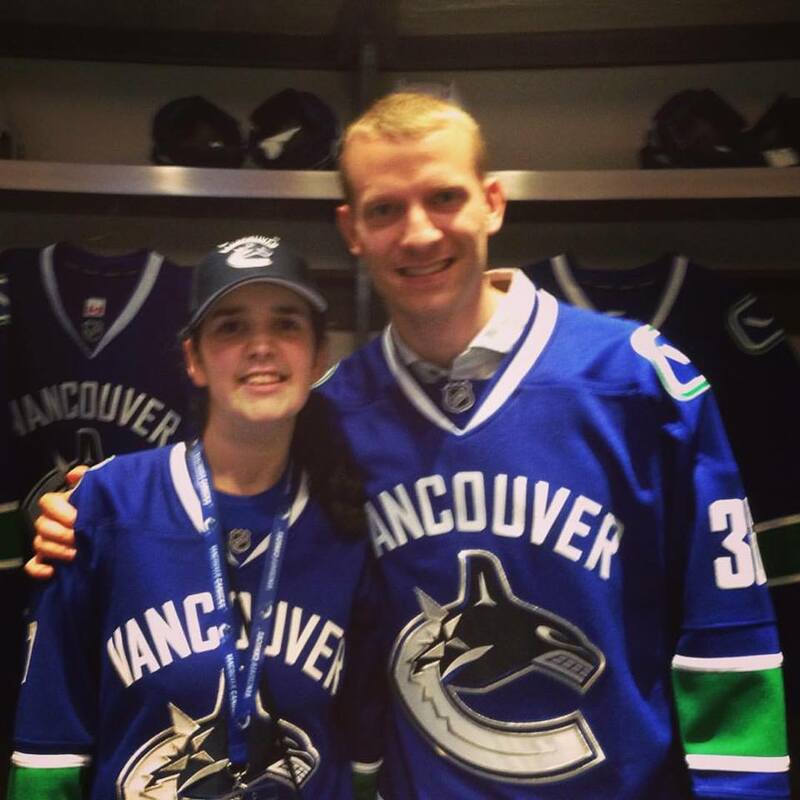 The Sedins are at the heart of this team in the way they play on the ice and set an example off of the ice. Speaking of the Sedins, they are still doing sedinery things. And yes they may not be producing their normal numbers but how lucky are we to have witnessed not one but TWO franchise leaders for the entirety of their careers from draft year to NOW. And by early next season we will have witnessed BOTH reach the 1000 points milestone. It seems incredibly fitting that Henrik’s 1000th point came on a goal assisted by his brother. As long as I live, I will long remember being there in the arena the moment Hank got that milestone 1000th point. Seeing that goal happen right in front of our seats followed by the entire team coming down the ice to celebrate with him will long be an all-time favourite moment for this kid. And yes I know that these moments may not seem like a lot when you focus on all of the things that have gone wrong over the season or the negative headlines BUT they are still a part of the fabric that is this season. It’s true that I could simply spout all of those negative truths as well but you already know all of those and you might just miss out on some of the magic that has happened this season. Sometimes, it’s good to step back from the constant negatives and see that amidst all of the havoc that has been this season, there were still some great moments and still remain to be a few before the season is over.